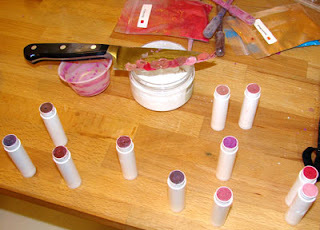 This is the final installment of our lipstick making tutorial. Post any questions you have and I will answer them in the comments section. Filling these little tubes requires either a very steady arm or a set of plastic droppers. I personally use droppers but for big single color batches, you can buy a filling tray from MMS. Check out the color variations I was able to achieve with just the colors in our Lipsafe Color Sampler pack. I added titanium dioxide to some of the colors but other than that, just relied heavily on the lipsafe micas and oxides easily available. Ingredient Listing for your lipstick is simple – list what the product is, INCI names in descending order of use, net weight of product and who manufactured the product. 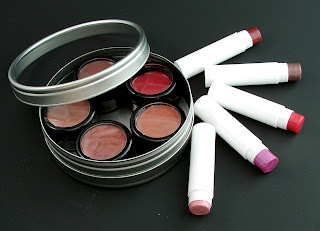 The FDA has a really comprehensive web site about labeling lipsticks. You can find it here. Who: “The name and business address appearing on the label may be those of the manufacturer, packer or distributor. If the name and address is not that of the manufacturer, the name must be preceded by phrases such as “Manufactured for …”, “Distributed by …”, or other appropriate wording. The name of the firm must be the corporate name, and the address may be that of the principal place of business. Stating also the name of a corporation’s particular division is optional. A word on the phrase, “The safety of this product has not yet been determined.” The short answer is that all of the ingredients in your lip balm have been tested and generally recognized as safe (GRAS). According to (b) below, your lip balm and lipstick probably does not require the safety warning. To be on the safe side, you’ll want to read and interpret the rules yourself and also check with your insurance company. Warning – The safety of this product has not been determined. The safety of a cosmetic may be considered adequately substantiated if experts qualified by scientific training and experience can reasonably conclude from the available toxicological and other test data, chemical composition, and other pertinent information that the product is not injurious to consumers under conditions of customary use and reasonably foreseeable conditions of misuse. b. Performance of additional toxicological and other testing appropriate in the light of the existing data. The FDA’s phone number, should you be curious about interpreting any of their information is: 1-888-463-6332. This is the main FDA Phone Number for general inquiries. They’ll pass you off to another department for specific labeling questions. I hope you enjoyed this tutorial. If you have questions, comments or want to share your successes with lipstick making, please post in the comments section and I’ll do my best to answer. Singing Wolf, the more liquid oils in the recipe, the thinner the consistency. The thinner the consistency, the more sheer the lipststick or gloss. So, the color will stay on the lips but also come off much easier. I love the tin/pot combo! I have a friend who prefers a “salve” like consitancy in her lip balm, stating that the one or two mini batches I’ve made in the past are too hard. My “basic” recipe is 1/3 each wax, a soft butter (like coffee or avocado butters) and liquid oil. To adjust the firmness, would I just drop the wax/butter levels and up the liquid oils? If so, how would that effect how well the color adheres to the lips? Thanks for the tutorial – I’ve been weeding through the FDC stuff and this has helped a ton. 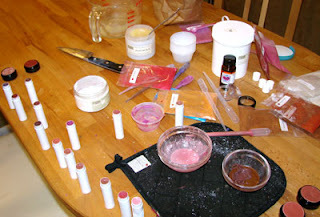 Also, I’m glad to know that your workspace looks like mine when I’m done making lip balms! Mica bags and messed up pipettes all over the place. What is the easiest way to label a round lip butter pot? This has been a fun tutorial.